Unsightly tear stains can prove a persistent pest to dog owners, particularly those whose pets don white fur. 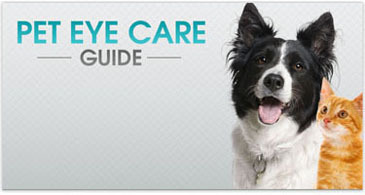 Instead of constantly cleaning your pet’s ocular area, why not tackle the problem at its roots? 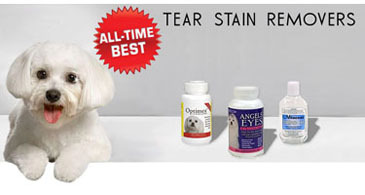 There are a wide variety of supplements available that work to prevent tear stains in dogs from ever forming. Among this preponderance of products only one can be the top-performer, and that product is Angels’ Eyes®! Angels’ Eyes is specifically formulated to eliminate tear stains around the eyes and those that form around the mouth from excessive salivation and licking. This product can completely remove tear stains in as little as 3 weeks and works without topical application. What’s more is that this unique solution to tear stains is available in a palatable soft chew form that is easy to administer. When it comes to finding the best supplement to prevent tear stains in your pup, there are countless customers that can attest to the efficacy of Angels’ Eyes Tear Stain Eliminator, so check out what these customers had to say about its fast-acting, incredibly effective formula. Susie and her greyhound love these incredible soft chew supplements- Susie loves the way they keep her dog free of tear-stains, and her dog loves the way they taste! Angel Eyes’ is also available in a palatable powder that can be mixed in with your pet’s food. But is the powder as effective as the chews? 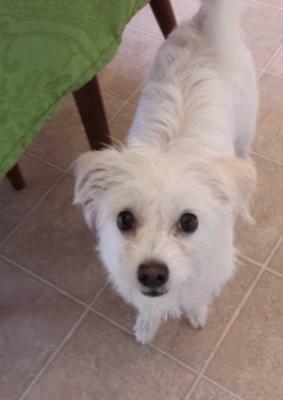 Carolyn and her pooch from San Luis Obispo, CA, sure think so! As for other benefits to this superb supplement, Duncman and his Shih Tzus advocate its use to relieve the odious odors associated with some tear stains. “Worked in three days! 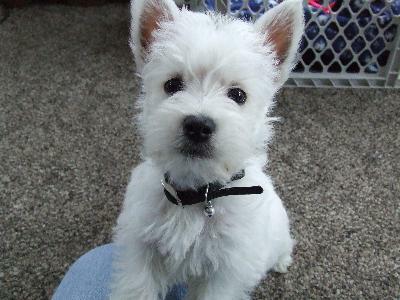 I have a Westie, 3 months old. Her tear stains were gone after the third day- she was pure white again. I did not use the full recommended dose...I use just a trace of the powder. “I don't need to use it everyday on her. I use it about every fourth day. I still haven't used the full dose! Just a faint dusting on her food, I'd guess I use about ¼ of the required dose. I didn't want to overdo it since she is so young. “This product is amazing. I tried the pet eye wipes, I tried bathing her, I tried it all...then I found this product. I can't say enough good things about it! For more information about this and similar products, check out the articles below! You've heard how effective this product can be for dogs, now try it yourself to see the amazing results! You can find this all-natural product in a wide variety of flavors for cats and dogs here!